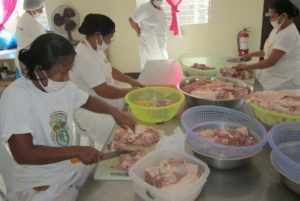 The Livelihood Program aims to help LCP members became self-reliant by teaching participants how to make different kinds of products and to market them using management and marketing skills. The Meat-processing project has been particularly successful, with 8,000 packs of chorizo (sausage) being produced every month. This not only provides part time employment to many women but also gives LCP community members an opportunity to sell the product of their own neighborhoods. Fifty percent of the profit is given to the women, with the remainder going towards the LCP residential shelter program, transportation for children to come to LCP and for community medical kits, helping with sustainability. There is also a thriving pig-dispersal program where families keep a sow, and when she breeds, the family passes two of the piglets to another family. The cycle is then repeated. LCP also provides opportunities for mothers to sew school uniforms and backpacks which are sold to the other children and youth, providing better quality than the ones purchased in the store. 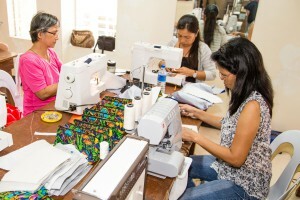 A new commercial embroidery machine was purchased and is now being used to beautify the handmade greeting cards as well as eyeglass cases, make up bags, aprons, t-shirts, and other items that are sold in local resorts and to volunteers.